It’s not just for the teams on the margins of the NCAA basketball bracket anymore – the women’s bracket, that is. It’s also for the more accomplished teams worthy of consideration for seeds on the fourth and fifth lines, where the stakes get higher. As in, who gets a first-round home game? Who has to travel cross-country? So even a full month out from Selection Monday, there was an angsty little subtext mixed into Saturday’s doings at McCarthey Athletic Center that went beyond how much space exists between Gonzaga and Brigham Young in the West Coast Conference standings. Oh, and there’s less of that now, too. Thanks to some appropriately nervy free-throw shooting by BYU’s Paisley Johnson in front of a sellout crowd of 6,000, the Cougars escaped McCarthey with a 66-64 win over the 13th-ranked Zags – and a regular-season sweep by mere seconds and inches. That pulls the Cougars within a half game of Gonzaga, with nothing but home games ahead. Of course, to BYU coach Jeff Judkins, those two points felt like 20. “I’ve been here nine times and this is the first time I’ve won,” he said. That previous futility only drove home to him how much has to go right for a visiting team to win at the Kennel. Like 6-foot-7 Sara Hamson blocking two shots in the last minute. Or making 10 of 15 3-pointers in the first half. Or knocking down three or four baskets with the shot clock rolling over toward :00. “If we don’t make those, we don’t win the game,” Judkins said. Or a foul 20 feet away from the ball with 2.2 seconds left. It was Zykera Rice fighting through a screen that put Johnson at the line for those game-winners, and if that’s an unsatisfying way to settle a tight, tension-wracked game, well, ask the New Orleans Saints about the alternative. Fact is, even after that early flurry of BYU 3s, there was a lot of game and plenty of chances for the Zags to assert their will long before the closing seconds. In the fourth quarter alone, Gonzaga held the Cougars to a single field goal and those two foul shots in the last 6 minutes – and the best they could get it to was a tie. “Some coaching errors, lots of individual errors – same story as last time,” said Gonzaga coach Lisa Fortier, whose team lost by two down in Provo last month when a 3-pointer and a putback both rimmed out in the final seconds. The Cougars have been Gonzaga’s special briar patch this year. The Zags’ only other loss in 26 starts came at the hands of then-No. 1 Notre Dame. They’re an interesting match – the Cougars running four guards around the orbit of their giant, the Zags all aggression and line changes, what with eight players averaging more than 20 minutes a game. If Fortier’s substitution count doesn’t get to 40, as it did Saturday, somebody must be down with the flu or a fracture. 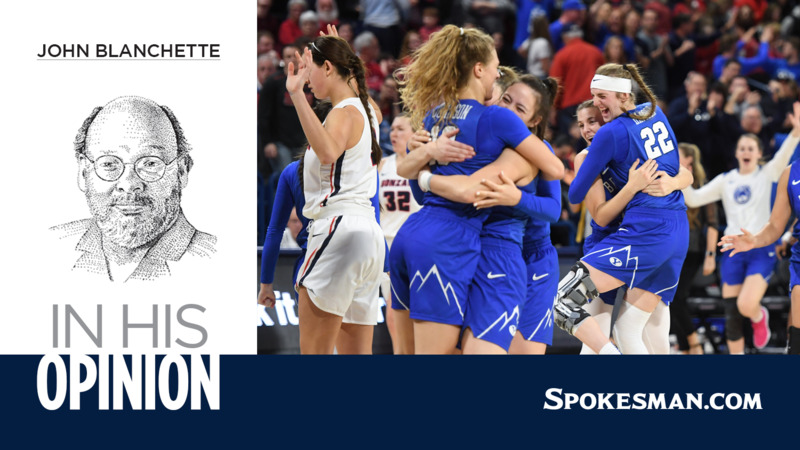 In the end, Fortier rued her players being perhaps too preoccupied with Hamson (“it’s not what she does, it’s what she could do”), and Judkins appreciated how his team with one senior starter didn’t buckle. Like they did after their previous win over Gonzaga. A week after that one, they inched into the Top 25 – and promptly lost three straight. The Zags will hardly be counting this one as a blessing. When the NCAA’s made its season-to-date bracket reveal a week ago, Gonzaga found itself happily placed as a No. 4 seed – 14th overall, roughly commensurate with its poll ranking and RPI. The special prize for the top 16 seeds come March is hosting first- and second-round games, a significant advantage if no free pass. In each of the past two years, 12 of the 16 hosts have moved on to the Sweet 16. Now, how much damage Saturday’s loss does to Gonzaga’s résumé and hosting hopes remains to be seen. BYU is hardly bum-of-the-month material – the Cougars were 36th in the RPI on Saturday morning, even with that brief swoon. But both the men’s and women’s selection committees love them some Power 5 schools, and that’s precisely what’s crowding the Zags from below. But maybe they’ll cut each other up. Judkins, however, has a more urgent matter: just making the bracket. But the Zags still have a pressing concern: BYU, Round 3. Published: Feb. 16, 2019, 7:45 p.m. Updated: Feb. 16, 2019, 8:35 p.m.